On May 25th, 2017, Florida’s Universal Orlando will be unveiling its latest attraction, a water park called Volcano Bay. This immersive theme park will be the third in the Universal Orlando complex. 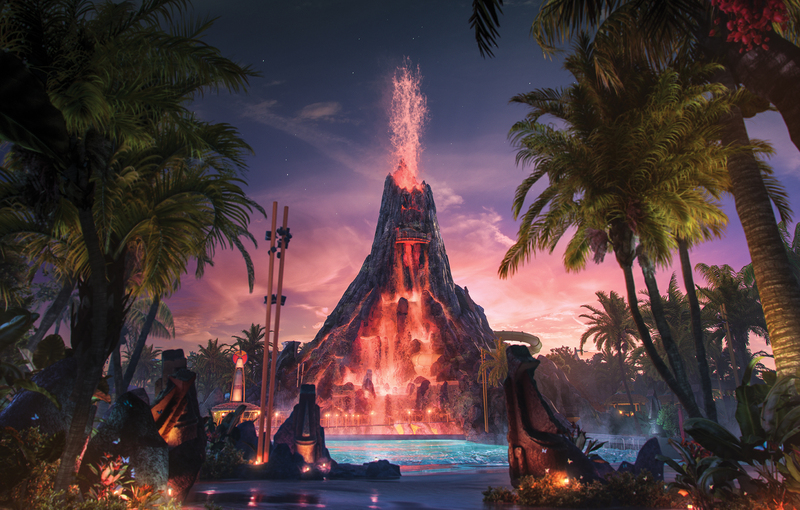 Universal Creative, the same team behind the Islands of Adventure park, traveled through the South Pacific for inspiration for Volcano Bay’s compelling myth. The park’s décor is influenced by Polynesian architecture and the cultures of the region. Water park fans will appreciate the state of the art facilities: multi-directional wave pool, a river, rafts, body slides, and more. Discounted tickets for Volcano Bay are on sale now. The myth behind Volcano Bay is integral to its experience, as every ride and attraction follows its theme of adventure and discovery. You will be greeted as one of the Waturi, a group of travelers guided by Kunuku, the mystical fish. The Waturi are travelers who believe in living life to the fullest and creating stories through adventures. At the center of the park stands the 200-foot Krakatau, the fire and water volcano. The volcano streams waterfalls during the day and at night fiery lava effects can be seen. Inside, guests can brave the many waterslides such as the Aqua Coaster, the Ko’okiri body plunge, and the all ages Punga Racers. Other attractions are broken up into Villages. The Wave Village is where you’ll find sparkling Waturi Beach, a relaxing pool at the foot of Krakatau. The River Village is an all ages part of the park containing multi-person slides, water guns, geysers, and dump cups. The night sky can be seen from the slow ride on Kopiko Wai Winding River. Inside the Rainforest Village you can ascend cliffs, ride along the Maku Puihi lava tubes, and go white water rafting. Each village has something the whole family can enjoy. The water park will be the only at Universal to have a Virtual Line. The Tapu Tapu, a waterproof wristband designed to hold places in line and alert wearers of activities around the park, will mean shorter wait times for guests. Universal Studios also offers a few deals for early buyers. For a limited time, you can buy 2 days at the park and get 2 days free for $200 per adult ($189 per child). This offer is valid through May 3rd, and must be used within 7 days from first use. Guests can also take advantage of the 4 Night Vacation Package, which is $89 per night per adult, if booked by April 11 and used by May 25, 2017. The package includes a 4 night stay at the Rosen Inn international, early park admission, and access to live entertainment at Universal CityWalk. The tickets can be used at Universal Studios and Islands of Adventure. For all three parks, Universal Studios, Islands of Adventure, and Volcano Bay, you have the 3 Park, 3 Day Ticket option, which starts at $260 per adult ($250 per child). You can contact Universal Studios at 877/801-9720 for more information on their packages.